Los Cabos Guide is a glossy tourist publication. They make their money from selling advertising and in certain cases, they allow merchants and restaurants to pay for the advertising with redeemable vouchers. 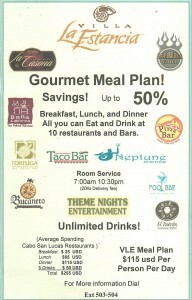 Los Cabos Guide then sells these vouchers at 50-65% of face value to the public. The vouchers are denominated in US Dollars and easily redeemable at the merchant or restaurant. You can order these before your trip and they’ll mail them to you or deliver to your hotel. You can also pick them up when in Cabo, but the office for Los Cabos Guide is several miles away from downtown (see map below). Update: unfortunately, Hurricane Odile hit this restaurant hard and they have not reopened. One of our favorites – gone from the Cabo dining scene. Great food and excellent service. Amazing selection of tequilas. We’ve had great meals here! Taqueria “El Paisa” is another local’s joint. In fact, you’ll likely be the only gringos dining. But, don’t let that dissuade you, as the food is excellent (for a very inexpensive restaurant). This is the exact opposite of the typical “marina” dining experience; very authentic and very inexpensive. The prices are right, so have fun and experiment. Order a lot of variety, have fun, and give the menu items a try. 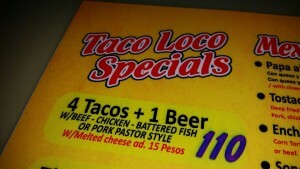 Menu items include grilled tacos of arrachera and beef, potatoes, quesadilas, vampiros, gringas and more. A family of four can probably eat for US$30 (and still leave food on the table). On Leona Vicario (the one-way main street heading south), about five blocks north of Lazaro Cardenas. El Pollo del Oro – Thumbs Up! Very affordable chicken, ribs and fantastic fish burritos. The ambiance is “local Mexican joint” (in fact, we heard it was a former covered basketball court). The prices are right (typically less than US$6 per person) and the food is usually pretty good. While we usually eat here once per visit for lunch or dinner, breakfast was so-so and as a result, we can’t recommend it for that meal. Located on Morelos and 20 de Noviembre, just north of the marina/mall area by about three blocks.